Over the course of the last few days several articles were published on the Syrian chemical weapons, the initial two in the New York Times, and in The Atlantic. On the basis of intelligence information, these articles indicated that some movement was detected recently in the chemical weapons facilities in Syria, and that Israel asked twice for Jordanian consent to attacking those facilities over the last month. It was also mentioned in the past by specialist that in order for those weapons to be used, there are several steps that need to be taken first, such as transferring the different agents, which are never stored together, and mounting those on a weaponized carrier. Same experts stressed that the Syrian chemical weapons cannot be deployed instantly, and such movement would point to a potential motivation to deploy them. The unstable situation of civil war in Syria makes these weapons of mass destruction a potential hazard to Syrians, but also to the surrounding nations as well. While the global community fears Assad's loyalist would use these against the Syrian people as means of last resort, a chemical expression of Assad’s ‘Let my soul die with the philistines’, there are also other concerns in the region. Turkey suspects that Assad would bomb areas close to its border, allowing for collateral damage to spill over and leaving Turkey to deal with the catastrophe. Israel fears that these weapons might be passed on by Assad to his allies, the Hizballah, equipping this extremist Shiite organization on its border with a tiebreaker weapon. Further concern can be attributed to the fact that global jihadist, of the Al-Qaida variety, are a part of the opposition fighting Assad's troops. These kind of weapons falling into those kind of hands can find their way to be used in a variety of scenarios such as in Iraq against the Shiite population, in Egypt against the Mursi administration, in Saudi against American targets, or against any of the numerous enemies the Salafi oriented Jihadist groups have vowed to destroy. To collaborate these suspicions, one has just to examine the aftermath of the Libyan "Arab Spring", and to follow the trail of the missiles, anti-aircraft/marine vessel guided weapons, and other munitions, that left storage rooms in Libya, and surfaced in Sinai desert, on trucks in Sudan, and in other parts of the Middle East. Such weapons were used against Mursi's army by Jihadist groups in the latest round a couple of months ago. These are the same type of weapons that were used against the IDF, the Israeli army, by Jihadist crossing over from Sinai into Israel. These are of the same Salafi oriented groups that were responsible for the death of the American Ambassador to Benghazi, and the Al-Qaida cells that are responsible for the incredible death toll in Iraq that reached 365 in last September as a result of the attacks on Shia civilian targets. 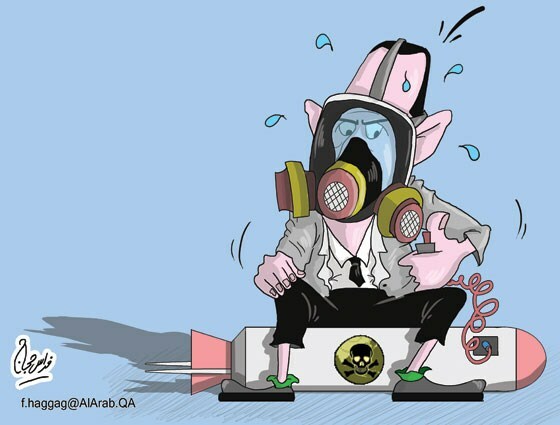 On the macro scale, the chemical weapons situation marks the concerns about post-Assad Syria. It is obvious to the different actors in the region that Assad’s days as the ruler of Syria are numbered, but it is quite in the mist what shape will the future Syria take. Currently, the struggle of the last relic of the Ba’ath socialist regime in the Middle East, for the most part has turned into a cross Islamic war between Sunnis and Alawite-represented-Shiites. In the mind of the Ayatollah regime in Iran, this is a battle for the geographical integrity of what the King of Jordan, King Abdallah, referred to as “The Shiite Crescent”, a connection between the Shiite communities in the different countries in the Middle East. This battle is already underway in Iraq, and does not seem to be coming to its final resolution in the near future. Concerned parties are wondering whether driving Assad away, will actually bring a halt to aggression, or will it in fact turn Syria into an extension of the battle waging next door in Iraq. It is yet uncertain whether the Shiite hegemon of the region, Iran, will give up its ally along with a convenient land bridge to its proxy army, the Hizballah in Lebanon, or will it continue to send in the Revolutionary Guards in order to maintain some sort of a supply route across Syria. On the other hand, there are also concerns that the strife will continue to spill over to the other Shia-Sunni mixed countries in the region, as it has in Lebanon and Bahrain over the last few months. It seems that not only the Syrian people are fighting for their future, but also the Islamic Jihadist, and the Shiite Crescent.